The polyphenols are a very broad class of compounds whose electronic spectra have an absorption peack at 280nm. 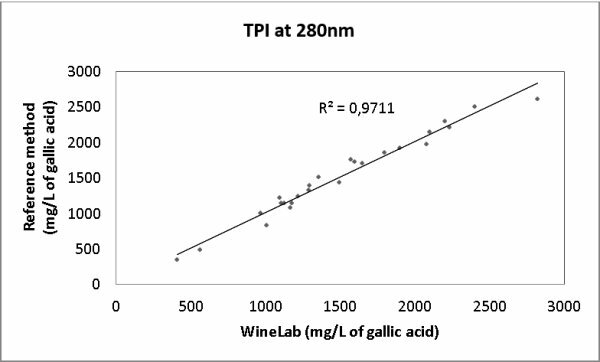 The photometric reading at 280nm is then proportional to the amount of the polyphenols present in wine or must sample. Testing time: one test 11 minute. Test sessions with several samples are possible, up to a maximum of 16. The calibration curve of CDR WineLab®, obtained using reference methods, confirms the excellent linearity of the system over the whole testing range. Use the wine as is or centrifuged must. Total Polyphenols Index was last modified: February 8th, 2019 by CDR s.r.l.